Researchers demonstrate their scanning technique, with a user holding a monopod-mounted Kinect at close range from a T. Rex skull. When a group of forensic dentistry experts set out in 2016 to investigate what may have caused some peculiar holes in a T. rex jaw, they decided to perform a 3D scan of the skull so they could examine the perforations more closely. But they ran into a big problem — the fossil skull was too massive to fit into existing 3D scanners. However, the Camera Culture research team at the Massachusetts Institute of Technology (MIT) Media Lab partnered with them to deliver those scans. They did it with a consumer product designed for gesture recognition in gaming — the Microsoft Kinect — and used open-source software to capture and process the data, quickly creating 3D digital models of the T. rex fossil, a process the researchers described in a new study. The skull belongs to one of the most complete — and most Twitter-famous — T. rex fossil skeletons in the world. Sue (@SUEtheTrex on Twitter) is housed at The Field Museum of Natural History (FMNH) in Chicago, measuring about 40.5 feet (12.3 meters) in length. Topping the skeleton is a replica of the dinosaur's skull; the real fossil weighs about 600 pounds (272 kilograms) and is displayed alone in a nearby exhibit case. Odd punctures on Sue's lower jaw have long puzzled paleontologists. Some experts argued that they were caused by a predator's bite. Others suggested that a parasite bored holes in the jaw through the mouth's interior; this parasitic infection may have been so severe that it caused Sue to starve to death. A 3D scan of the jaw would allow researchers to examine the holes more closely to figure out the culprit. The Kinect offered a unique solution to scanning such a large and heavy object — rather than muscle the fossil into a scanner, simply walk the scanner around it. 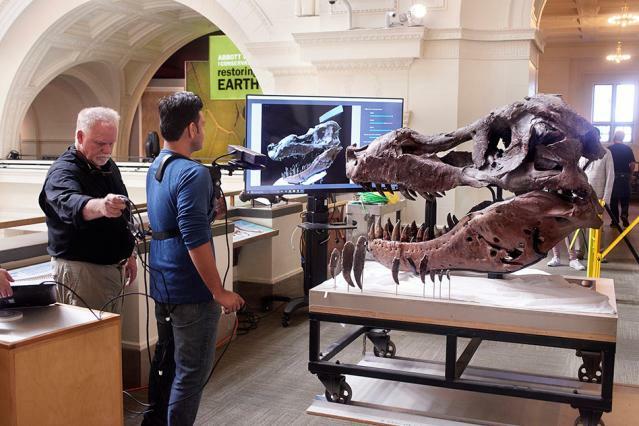 In a scanning technique that captured details of Sue's skull, a user held a monopod-mounted Kinect at close range from the fossil. More important, a Kinect is light and portable and has a wide field of view — 70 degrees horizontal and 60 degrees vertical. A single user can carry it on a monopod or wear it on a special rig and walk around an object to create a 3D scan, which is exactly what the study's lead author Anshuman Das did, he said in a statement.